ENJOY THE VIEW AND AMENITIES IN THIS TOTALLY RENOVATED LUXURY VILLA! 3321 Villamare with a partial ocean view has been updated this past Fall. New tile flooring in the master bedroom and second bedroom has complimented the tile in the living and dining room area. New king sized bed and bedroom furniture in the master suite and 2 new queen sized beds in the guest bedroom. Granite counters throughout bathrooms as well as tile flooring. Full tile shower in the master bath with beautiful glass blocks providing privacy in the soaking tub area from the bedroom. Tub and shower combo in the guest bath room also with tile walls. Updated furniture and bedspreads throughout the condo. Flat screen TV's in both bedrooms and the living area. The kitchen is fully stocked with everything you could want in a luxury villa. If you need something all you have to do is ask. It also features a keyless entry. Palmetto Dunes Plantation, a private gated community which contains the Van Der Meer Tennis Center, the George Fazio, Robert Trent Jones and the Arthur Hills golf courses. All within close walking distance of this vacation villa. Palmetto Dunes has miles of scenic bike trails and streams available for canoeing and fishing. The Villamare has more amenties than any other villa complex on the island. You hardly will ever need your car on this vacation. It is next door to the Marriott and a short distance from the Hilton oceanfront resort. It's amenities include a large oceanfront pool and hot tub with a cabana and sundeck, a heated indoor pool with a jacuzzi, an exercise room with updated and brand new equipment, underground parking and a barbecue/picnic area. All of this on a beautifully landscaped area. The private health club contains weight machines, a steam room and sauna. A convenience store is within a easy walk. FREE SHUTTLE SERVICE is provided by 'PALMETTO DUNES BUGGY' in effect from March to October from 8am to 9pm. Regular stops at Shelter Cove Plaza, Mall, and Harbour, the Plantation Center, Dunes House & Palmetto Dunes Tennis Center. GREAT way to go shopping, golfing, play tennis and visit local restaurants. Our unit is close to the indoor pool and health club and is only a short walk through lush vegetation to the ocean and large outdoor pool. This luxurious third floor villa offers a spacious living and dining area with a large master bedroom with a king-sized bed and private bathroom with a large soaking tub. The second bedroom has two queen beds and a private bath. The living room has a queen sleeper-sofa providing three sleeping areas. A balcony is located off each bedroom and the living room. THIS IS A NO PET AND NON-SMOKING UNIT!! NO EXCEPTIONS!!!!! During the peak rental season, June through the second full week of August, we only offer Saturday to Saturday rentals! Also, we offer monthly rates in the off season and winter months. Please email me with your inquiry for these rates. Usually a monthly rate is about the same as a weekly rate in the high season. The car pass is $30/month and the weekly pass is $25. There is a 3% credit card assessed to rental fee. Master bath has full tile shower and separate soaking tub. The second bath is a tub/shower combo with tile walls for the shower area. The condo has a partial beach and ocean view. This means that you are not ocean or beach front but are able to view both from the living room and master bedroom. All linens provided. Towels, bed linens and dish washing towels. Covered parking underneath the complex as well as outside parking nearby. Garage parking under the complex with additional parking outside. Broadband, high speed and wireless. Indoor pool, hot tub and sauna. Treadmills, elliptical trainers and bikes provided. Universal gym and free weights are also provided. We have serving places for 8 people plus. Full kitchen with all the cooking utensils and pans needed. The kitchen countertops are granite. It also has a counter top that supports two bar stools in the eating area. The dining table has 6 chairs with an adjacent area that has two stools at the granite counter/bar area. Soaking Tub in Bath, Indoor Pool, Outdoor Pool, Kiddie pool, No Smoking!! The apartment was a nice place to eat and relax. Condo was nice and roomy. Living room chairs were broken down. My elderly father sunk so far down in one of them that he had trouble getting out. Also the fire alarm went off at 3:30 in the morning one night and when we evacuated, one of the residents said this happens frequently. There is evidently something wrong with the alarm system because even after the alarm was canceled, it would go off for a few seconds every few minutes for 30 minutes or so. I did check about the fire alarm as my previous guest, who had stayed a month, said there was no alarms going off so unfortunately, the alarm system did go awry for Thanksgiving week. It is fixed now. As far as the chairs being broken down, I am sad and it is my "bad." We replaced almost everything this past year and a half except the kitchen appliances, these chairs and the couch. Master bedroom furniture, tables, end tables, lamps, reupholstered the dining chairs, new washer and dryer, bed covers but did not replace the couch and unfortunately not the chairs. The couch was replaced a few years ago as it was a very poor choice on our part but the chairs seemed fine last year and we were going to replace them in the next year or two as we rotate replacing items for our own cost base. Well obviously our plan has changed and we will replace them when we go down in January. My Dad is 90 and stays in our condo during part of the winter so this review was very relevant to me and very concerning. I can only say I am very sorry for the inconvenience and issues our guest had. I am a very hands on owner and really do listen to our guests and fix the issues as soon as I can. Overall we had a nice stay and enjoyed staying in this unit. There were a couple of things that need to be addressed. The master shower needs to be regrouted and the vent in the master bath needs to be fixed. The only other issue we had was related to the cleaning. Upon our arrival we found a dirty, musty rag on the counter that seemed to be attracting nats and the floors appeared as though they had not been cleaned (very sandy). Upon calling the office they sent out someone to clean the floors and address the nats the following day. Overall, we had a wonderful time and would consider renting this condo again in the future and the owner was easy to work with and answered our questions in a timely manner. I always appreciate reviews so I know what I need to attend to or what is already great in place. I had been made aware of the grout's condition in the master shower and have it already on the list of repairs for the off season. The vent is a easy fix and the cleaning staff well that is something I have been working on through the years. This is our third company in 5 years and we get the recommendations from the management company we use and they work hard to find good ones. This was the first notice of dirty floors so I am hoping it was just a one time skip. The company has been notified that they are the ones that can make or break a great stay and I have reminded them that they represent how my unit is viewed. We put great quality into our unit and we do expect that the cleaners represent this quality as well. This unit was like it showed on the pictures. 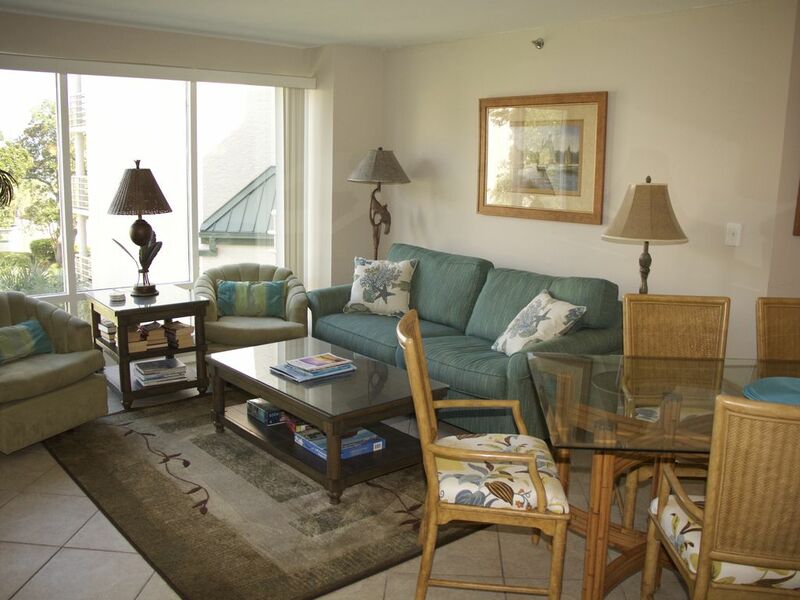 It is a nice unit that is close to the beach and owners were easy to work with. We had nice weather and a nice trip. The only negative was the slow elevator in the complex. My family and I enjoyed are stay here during fall break. The condo was clean and spacious. The kitchen was a little smaller than some of the other condos we have stayed in Villamare, but it was really no issue. Nice large dining table for a large family to dine at. The furniture was clean and comfortable. We would stay here again! No Pets and No Smoking, no exceptions!!!! Palmetto Dunes gate pass $10/week/vehicle or $30/month/vehicle. September, 2019 gate pass increases to $25/week. There is a 3% credit card fee on all credit cards and electronic checks. This is added onto the balance of the rental.